Great that I received at least 5 pouches/wallets/organizers/ecobag this Christmas. Gift giving and Christmas parties aren’t even over yet though it’s already January. It’s possible I may receive more of this kind. But truth be told I appreciate gifts like these. It’s a bonus if it’s pink or something really colorful ‘coz that’s how I like most of my stuffs. I need these things but I don’t buy them for some unknown reasons. Maybe because I subconsciously think I’ll get some for Christmas anyway. And when I need replacements I’ll also get them on the next holidays. Happy! Some of the organizers I received. Got handkerchief and towels too.I like that those gifts are super practical. No matter how many of these you already have, new additions are always very much welcome. I also got bars of soap in an exchange gift and an umbrella which I like a lot because of the logo it bears (LecCom Ministry). Hmmm…What more did I receive? My sister gave me a special bracelet-which is expensive according to her. I used this on Christmas serve (Mass at 7AM in the cathedral) and will use it all the days after that. I met a lot of people this year. Mostly new friends from church ministry whom i should say are a bunch of crazy, cool and kind LecCom. My weekends and holidays are busier than weekdays and its mostly because of my church schedule and commitments. 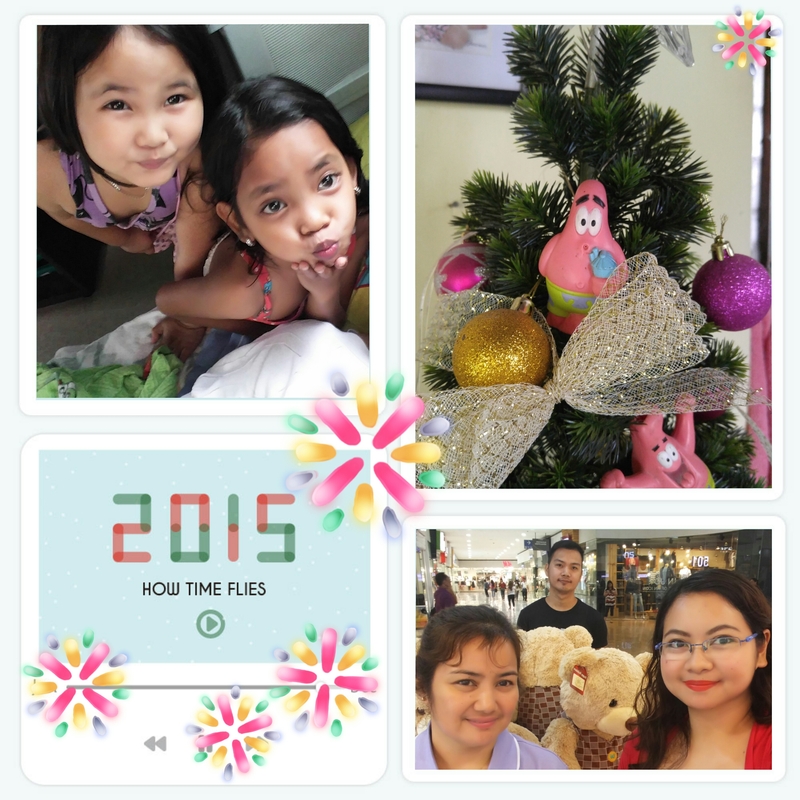 This December I happened to attend 3 Christmas parties/get-together and one wedding with my newfound friends. Probably one of the best non-material things one can receive. Lectors and Commentators Family. “The only normal people you know are the ones you don’t know that well.” Crazy, beautiful people. My cousins from a distant province visited our clan. We were reunited with them for a short while. The gift of family and extended family. In all fairness to the company which I currently work for, they gave out quality Christmas food packages. Though I didn’t attend the global group Christmas party I helped prepare the Christmas presentation which won the grand prize! Got some praises and thank you for that from my boss. (The participants and supposed to be participants….never mind.) So that’s another non-material gift this season. For our own company’s party, I helped host the games and raffle. I enjoyed the gifts I received. But the joy I felt upon seeing some reactions from recipients of my gifts are equally, or maybe even more, enjoyable. Thank God they liked the gifts ‘coz I had really put some thoughts before and upon my rush purchases. Smartwatch I got from office Christmas party raffle. This year I kind of started to recycle gifts but I gave out the more expensive ones like the smart watch and the portable video recorder (spy pen) I got from a raffle to my two brothers. With kids I gave out gifts and money. 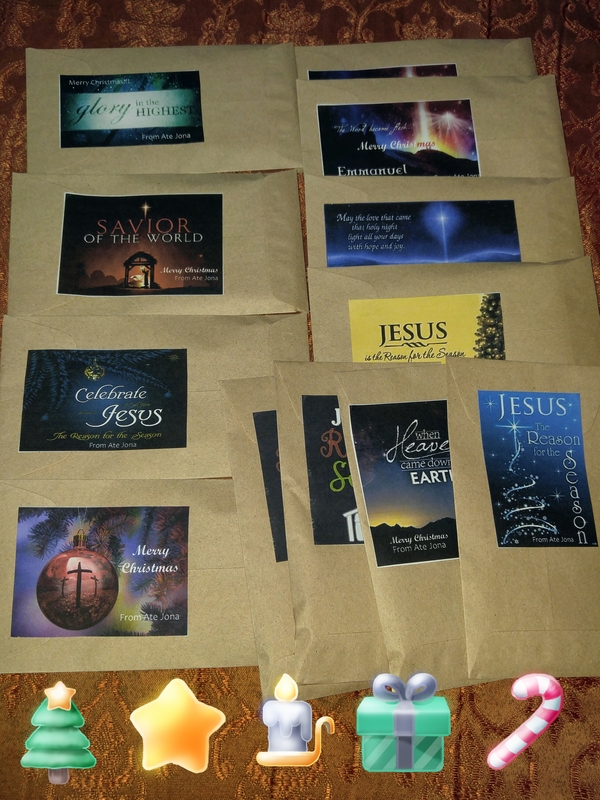 It’s my second Christmas to print stickers to seal or label the money envelopes. I make it an effort to give not only material things but real good news to my godchildren most of whom I only see once a year. The following day or afternoon those kids will head to the mall and spend the money but the message in the stickers I hope will be instilled in their young minds. I wish my financial capacity could give more to my inaanaks but for now we all have to make do of what is, hehehe. Godparents shouldn’t be obliged to give material things during Christmas, yes. But at least be there for them in some ways. Escape is a big no-no for me. That’s to say people are only after money. I’m lucky to have great and faithful godmothers while growing up until I finished college. They always made me feel loved not only during Christmas so to emulate and thank them I just wanted to pay it forward.